Nuevo Vallarta Luxury Resort Grand Velas Riviera Nayarit, Mexico. 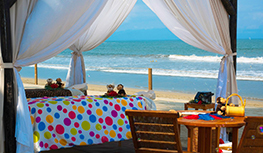 Experience the essence of luxury and the natural beauty of Mexico's Pacific Coast at Grand Velas Riviera Nayarit. From the moment you enter our lobby, you will be greeted with a hibiscus tea infusion, scented towel and relaxing massage. Rejuvenate at the spa, savor global cuisine, dive into our infinity pool, lounge on the beach or play a round of championship golf. At Grand Velas, you are free to indulge at your own pace. Our "Beyond All Inclusive, Beyond All Compare" concept creates a sublime vacation experience with gorgeous ocean view suites, incredible dining and recreation. Play in paradise with our Activities Program, which sets up snorkeling, kayaking, water aerobics, tennis and scuba diving classes, and enjoy live music in our beautiful amphitheater, with fiestas and theme nights that celebrate the culture of Puerto Vallarta. It's all here. This new program inspires families and couples to power down, disconnect from the world and focus on enjoying time with one another. 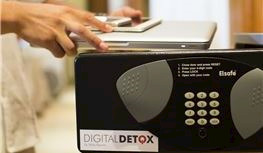 The Detox Concierge will "cleanse" your suite of all electronic devices.It's time to unplug and recharge. Grand Velas makes traveling with babies simpler with family-sized suites and a dedicated Baby Concierge to make arrangements and recommendations. We help keep babies happy so parents can relax in paradise. This service comes with special pampering and a certificate celebrating the milestone. This can be combined with a 25-minute Sunrise Massage for 1 to 3-year-olds to stimulate their senses, allowing them to differentiate textures and sounds.